Pohon Ginje or yellow oliander (Thevetia peruviana (press) K.Schum). Habitat: It grows wild in the fields and as an ornamental plant in dry areas in the lowlands to 900 m above sea level. 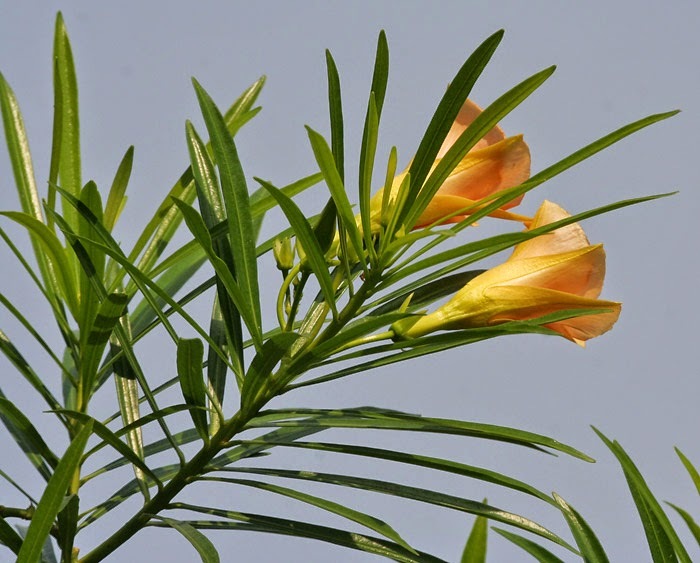 Description of the plant: Plant shrubs, annuals, approximately 1.7 meters high. Woody stems, grooved, jointed, branched, green color. A single leaf, the shape finegry, jagged edges, base and pointed tip, 4-12 cm long, 5-14 cm wide, green color. Compound interest, panicle shape, crown shape of the kidneys, the reddish yellow color. Fruit boxes, bears two to four, approximately 7.5 mm in diameter, blackish brown color. Simplesia Name: Cement nerifoliae Thevetiae. Chemical Ingredients: Tevetiana (alkaloids gigitalis); Nerifolin; Perufosida; Rufosida; Fatty oils. Efficacy: Tonika; diuretics; Anti swollen. Ginje leaves 17 sheets; 7 herbs cabe jamu ( piper retrofactum ), finely ground and water; crushed and screened, Air filter applied on the infected skin 2-3 times a day.